On the surface, nothing could be easier than just getting an audio signal from one place to another – no amplification, no conversion of mechanical energy to electrical energy or vice-versa. But the truth is, every cable must transfer a complex, multi-octave signal without losing, changing or coloring any of the information carried in that signal. Unfortunately, ordinary guitar cables – even the so-called premium ones – just don’t have the capability to do their intended job without major signal degradation. The serious electrified musician has been left without a viable alternative – until now. Alessandro High-End Instrument Cables are the finest cables currently available for musical instruments. Manufactured with functionally-perfect silver and copper conductors protected by high-performance insulation, these cables have significantly better response and dynamics than any traditional cable. Exclusively manufactured for Alessandro by Audioquest® – a world leader in high-end cables – these cables will be a must for every musician. 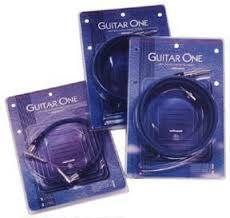 We manufacture a wide variety of cables for instruments, amplification and studio use. Check out the specifications and prices on our complete line of Instrument Cables and Studio Cables. NOTE: All instrument cables are terminated with a 1/4″ plug; please specify straight or right-angle plug when ordering. Alessandro Instrument Two, the next level cable, utilizes the same conductors as the Instrument One, but is Double Balanced. The double balanced design uses two conductors within the triple shield, eliminating the shield as a signal conductor. There is a dramatic increase in dynamics and response in this uniform, directional, double balanced conductor design. For best performance, use these cables with the arrows pointing the same direction as the signal flow (Instrument –> pedal effects –> amplifier). Read Reviews at Harmony Central. Alessandro Series Three is our most current and technologically advanced cable. It combines state of the art patented technology with musically tested performance. The symetricoax technology delivers articulate, detailed signal without coloring the sound of the instrument. The Ohno Cast Copper is the finest copper audio conductor and delivers every nuance of your technique. The term "high-end" has been used in the home audio market for many years now. Classic circuit design, vacuum tube technology, and scientifically-engineered components are carefully selected and combined to provide an extraordinary listening experience for your enjoyment. When modern audiophile components - such as high-purity, grain-oriented copper and silver conductors - are combined with time-tested circuit designs which have been refined and improved upon over the last 50 years, a level of performance is achieved which has never before been available to the professional musician. That's the DNA of every Alessandro product. © 2016-2017 by Alessandro Products; all rights reserved.